As you can see, I've been buying more dark meat chicken lately. The one thing I am willing to spend money on is high quality food. I try to save where I can, and white vs. dark meat chicken is one of those places. 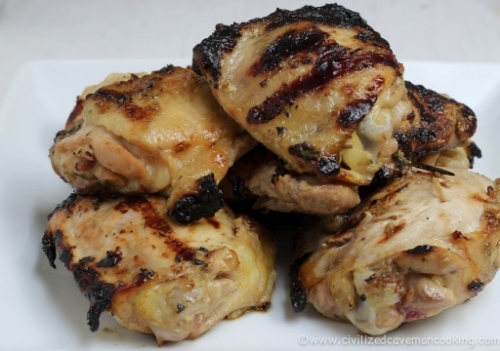 Dark meat has a higher fat content so it helps you stay fuller longer. It also contains more iron, zinc, riboflavin, thiamine, and vitamins B6 and B12 (source). On a practical level, I also find that it's hard to mess up cooking it! It has more flavor and is more difficult for me to dry it out. For the salad, I just tossed cut kale and brussel sprouts with some homemade olive oil dressing and served with avocado - roughly based on this recipe. There's no recipe for this - just a grilled hamburger patty topped with some veggies and condiments. I eat it bunless with a fork and knife. It's fast, easy, and requires no clean up... and I've been craving burgers lately. Coastal Salad (without chips) at Company Cafe in Dallas <-- highly recommended. It was so good and fresh tasting. Breakfast and snacks were pretty standard - eggs, spinach, and bacon for breakfast or an omelet with prosciutto and cheese. Almonds and apples for snacks. Whey protein after my lifting workouts. Have you made anything good lately? Please share!